Curious about Matches? We were. Posted on February 10, 2011	by Megan L.
Since this was not the first time we have come across matches/matchbooks in an NPS collection, (see examples to the left from Roger Williams National Monument) it seemed like a good time to do a bit of research into the history of matches. In researching matches, we came across some useful dates and learned a few new things. 1830 – Charles Suaria created a match with white phosphorous, which is poisonous. 1855 – safety matches were patented by Johan Edvard Lundstrom. 1911 – The Diamond Match Company released their patent at the request of President Taft and congress placed a high tax on matches made from white phosphorus, encouraging the end of these toxic matches. 1912-1915 – the phrase “Close Cover Before Striking” began to appear on matchbooks. 1973-1978 – Strikers were moved from the front of the matchbook to the back. While some older matchbooks used a back striker, there were no more books produced with a front striker after this time. What does this mean for archeologists? While they do not show up often, matches and matchbooks appear in archeological collections from time to time. 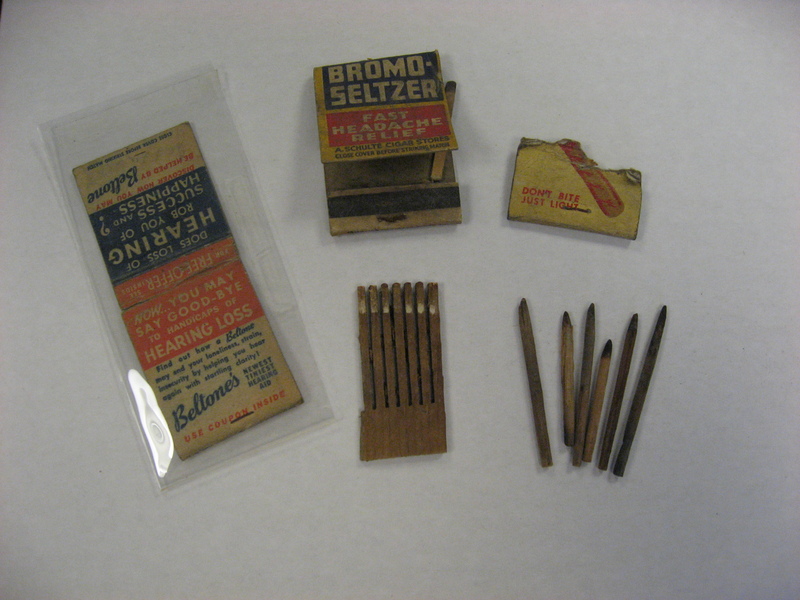 Knowing when a safety match was first in use or recognizing datable features of a matchbook aids archeologists in determining a date range for an archeological context (see post Spotlight On…Pipe Stems for more information on dating archeological remains). Megan graduated from Boston University in 2008 with an M.A. in Historical Archaeology. While in graduate school, she wrote her master's thesis on 18th-century glass drinkingware excavated during the Big Dig and interned with NMSC for 2 years. Megan has been a full-time employee since February 2010. This entry was posted in A bit of History and tagged matchbook, matches, safety matches. Bookmark the permalink. 4 Responses to Curious about Matches? We were. What a wonderful new addition. Congrats with continued success. Keep us informed. Your detail about the friction matches of John Walker, is not correct. He invented the friction match (although he never called them friction matches) in 1826 and the first recorded sale was written in his chemist daybook (sales-ledger) on 7th April 1827. He never called them “Congreves”. His name for them initially was “Sulphurata Hyperoxygenata Frict”. Later he refered to them as “Friction Lights” and also as “Attrition lights”. Congreves were introduced in 1832. Thank you for your comment. We are always happy to receive additional information about the artifacts we have featured on the blog. Thanks for reading!